The talks between China and India on the vexed border issue have entered a new stage of "setting forth major guiding principles" taking into account the strategic, long-term perspective and deeper level of mutual adjustments. The visiting senior Chinese leader, State Councillor Tang Jiaxuan, today called on Prime Minister Manmohan Singh and told him that Beijing was supportive of a bigger role for India in the international community, including in the United Nations Security Council. The body of south India’s most wanted forest brigand, Veerappan, was buried at Moolakadu, near Mettur, in Salem district early morning today. Time-tested war horse Lal Krishan Advani today made a valiant effort to uplift the sagging morale of the party cadres and stop crippling infighting within the second generation leaders by training BJP guns on the Congress and the Left. New BJP President L.K. Advani’s trenchent criticism of the UPA government and the Prime Minister today elicited an equally strong response from the Congress which accused him of adopting a “destructive attitude” and of toppling the government. 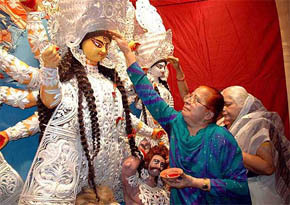 Bhupinder Singh, younger sister of Prime Minister Manmohan Singh, decorating Goddess Durga at her residence at the Merlin Park complex, near Kolkata, on Tuesday. Former National Security Adviser Brajesh Mishra today said the tendency to tailor intelligence inputs to suit pre-determined action would lead to greater disasters than intelligence failures. India is among the 55 most corrupt countries in the world and has done little to clean itself of corruption than Pakistan, according to the Corruption Perception Index, 2004, report. External Affairs Minister K. Natwar Singh has constituted a Policy Advisory Group to advise him on important foreign policy issues, ministry spokesman announced today. The group comprises independent scholars and experts, apart from the Foreign Secretary and other senior officers of the Ministry of External Affairs. Modernity versus tradition, Garba faces an identity crisis in Ahmedabad. Band of Boys ready with "Kiss Kis Ko...'"
Highly guarded in directly expressing Beijing's support to India's bid for a permanent seat in the United Nations Security Council (UNSC), Chinese state councillor Tang Jiaxuan expressed optimism about the future prospects of the talks on the border question. Mr Tang, however, said China endorsed India's stand to play a "more important role in international affairs and the UNSC for world peace and development." On the vexed border issue, the visiting leader who now oversees China's foreign policy, emphasised that in his 44-year experience he has found resolving border disputes to be the most difficult and time-consuming task. "Such negotiations are based on continental interests and the sentiments of the people of the two countries," he added. Mr Tang, former foreign minister, told a select group of mediapersons here that the negotiations had to be positive and prudent along with protecting the interests of other nations. "All out efforts have to be made to reach a just and mutually acceptable solution. Such negotiations are very sensitive in the regional context and at home. It will take some time and both sides need the opportunity to settle the boundary question at an early date," he said. He said a "very good start" had been made in the three rounds of talks between the special emissaries of the two countries on the boundary issue. In this context he spoke about National Security Adviser J.N. Dixit going to Beijing next month for a new round of negotiations. On the specific issue of the alignment of the Line of Actual Control (LAC), Mr Tang said the matter had entered a new stage. He said China's stand had been most consistent and unequivocal on the Kashmir issue. "We support India in its endeavours to settle the Kashmir issue through peaceful means." On measures taken by Pakistan to control terrorism from its soil, Mr Tang said China had expressed its concerns in this regard to Islamabad and impressed upon them to adopt more forceful methods to tackle this problem. Mr Tang drew pointed attention to China and Russia settling their border dispute which was more complicated. Similarly, the proposition of the leaders of China and India is to end quarrels and move ahead on the principles of mutual understanding and concessions, he added. On dealing with terrorism, Mr Tang said his country was also a victim of this menace and Al Qaida. Terrorism was the common enemy of mankind in defiance of peace, development and stability. "We are willing to cooperate with India to fight terrorism. It is necessary to study the symptoms and root cause of this problem for dealing with it in a comprehensive manner." During Mr Tang’s visit and his talks with the Indian leadership, the two countries also agreed to double to $ 20 billion within six years their current bilateral trade volume. Sources in the PMO said Mr Tang’s meeting with the Prime Minister lasted for half an hour. The talks were held in a “warm and cordial atmosphere”. National Security Adviser J.N. Dixit and Foreign Secretary Shyam Saran were present during this meeting. Mr Tang conveyed to Dr Manmohan Singh the greetings of President Hu Jintao and handed over a letter from Premier Wen Jiabao to the Prime Minister. The State Councillor briefed the Prime Minister on the recent developments in India-China relations which he said had maintained a sound momentum. As a result of the efforts of both sides, the bilateral relationship has entered a new phase of development. Dr Manmohan Singh expressed satisfaction over the development of India-China relations and expressed the commitment of the Government of India to further develop bilateral relations and exchanges with China. He noted the enormous scope for cooperation between the two countries. The Prime Minister expressed happiness that the Chinese Premier will be visiting India at an early date and mentioned that a warm welcome awaited him. The body of south India’s most wanted forest brigand, Veerappan, who was slain by the Special Task Force of the Tamil Nadu police on Monday night, was buried at Moolakadu, near Mettur, in Salem district early morning today. Veerappan’s wife, Muthulakshmi, his two daughters, Vidyarani and Prabha, his brother Madheyan and wife Muniapppa were present at the burial ground. Madheyan, serving a life sentence in Coimbatore prison, for an attack on a police station in Erode district, was granted parole and taken to Mettur. Around 2000 persons gathered at the burial ground to witness the dreaded poacher and sandalwood smuggler’s body being lowered into the grave. While the STF personnel celebrated the elimination of Veerappan as part of their successful intelligence operations by bursting crackers, there were also murmurs of protests at Moolakadu, where Veerappan’s wife resides. A sobbing and agitated Muthulakshmi criticised Salem SP Mr Pon Manickavel for not handing over her husband’s body in time for it to be taken to Veerappan’s native place, Gobinatham in Kollegal taluk in Karnataka. Another resident of Moolakadu said, “Many might be celebrating his death but among the local Vanniar community, we feel we have lost a powerful man who was our headman.” Some even said they would move the National Human Rights Commission on the manner Veerappan was killed. 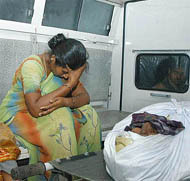 Veerappan’s body was taken to Moolakadu on last night from the Dharmapuri government hospital in an ambulance. Civil rights lawyers suggested that the body be buried instead of cremated, which was the usual practice among Vanniars, to enable exhumation in the case of a future probe. According to Tamil Nadu Home Secretary Sheela Rani Chunkath, the STF, which was constituted to nab Veerappan, would continue to function. Ms Chunkath, who visited the STF headquarters at Sathyamangalam in Erode district, along with the state Director-General of Police, Mr I.K. Govind, said the STF would be used as an elite commando force. The Home Secretary and the DGP visited the STF to congratulate the force on behalf of Tamil Nadu Chief Minister J. Jayalalithaa. The state government will organise a felicitation function for the STF here on October 27 at Nehru Stadium. The state government feels that the STF was needed for some more time to curb the activities of Veerappan sympathisers and Tamil extremists linked to his gang. A sum of Rs 50 crore has been spent on maintaining the force and its operations since 1993. Many human rights activists and lawyers here today demanded a judicial probe into the killing of forest brigand Veerappan in a police encounter on Monday night and said they would move the National Human Rights Commission. They alleged that the entire incident was stage managed. Other human rights activists, Mr P. Sukumaran and E. Kalyani, along with Kolathur Mani, an LTTE sympathiser involved in organising support for victims of police excesses during anti-Veerappan operations over the years, who were present at the outlaw’s last rites in Mettur, issued a statement demanding a probe. They questioned the STF version on the exchange of fire on Monday night in which Veerappan and his three accomplices were killed. They alleged that the prominent bullet hole on the brigand’s forehead looked like he was shot from close range. A key question raised by them was why Veerappan could not be captured alive if he had been lured into a police trap. The Karnataka Government will initiate an inquiry into the “nature of support” that Veerappan received during his lifetime and also to find where the forest brigand had stashed money and arms he had looted during his four-decade terror. Time-tested war horse Lal Krishan Advani today made a valiant effort to uplift the sagging morale of the party cadres and stop crippling infighting within the second generation leaders of the party by training the BJP guns on the Congress and the Left. Mr Advani’s strategy to arrest the shrinking base of the party and the losing appeal of the BJP among the electorate was unravelled at a crowded press conference at the party headquarters where he used old ideological arguments and deployed weapons of the 1985 vintage. It was also ignoring the common man by its failure to control inflation, he said. Mr Advani, who was forced to assume the party’s charge on Monday this week in the wake of an unexpected resignation by his predecessor, Mr M. Venkaiah Naidu, accused the UPA government of playing with the security of the country as its “handling of the various challenges to internal security is undoubtedly the worst since Independence”. The new BJP President, whose appointment to the party’s top post would be ratified by the party’s national executive on October 27 at the Talkatora stadium, defended the party’s ideological beliefs saying that “it shall be my endeavour to galvanise the BJP and effectively counter” the ideological offensive of the Congress and the Left. Using his earlier successful weapon which helped the BJP in the past to foster an element of insecurity and discrimination among the majority community, Mr Advani stressed that the BJP would not “allow India’s security to be threatened and her unity to be weakened by those for whom minorityism has become a passport to power”. The BJP and the Congress were the two national parties in country’s democracy, he pointed out and added that while the former was a “nationalist” party also, the latter had ceased to be one. He alleged that the Congress-led government had relegated administration to the “back seat” and given “front seat” to attacks against its political opponents. “It is a sad irony, and a deeply worrying development, that the Congress, which was in the forefront of India’s freedom struggle, has surrendered itself to the care of a dynasty, now headed by a person of foreign origin”, he stressed. Mr Advani said that the Congress was “willing to sacrifice commitment to nationalism at the altar of vote-bank politics has also become clear in two recent episodes: Insult to Veer Savarkar and the imprisonment of Sushri Uma Bharti in a false and politically motivated case”. “For example, many observers have described the large-scale infiltration of Bangladeshis into India as “demographic invasion” that could lead to the creation of a “Third Islamic State” in our subcontinent in the coming decades”, Mr Advani pointed out and accused the Congress of traiting this “mortal threat” with “eyes wide shut”. The BJP chief said terrorism, which was restricted to the western front, had now spread to the north-eastern parts of the country and the government had allowed lifting of the ban on the People’s War Group (PWG) in Andhra Pradesh, letting them join hands with the Maoist Communist Centre (MCC). Observing that the naxalite problem had become “more serious” owing to the developments in Nepal, he recalled that the BJP-led NDA government had declared that it would talk to any insurgent group only after it gave up arms. Asserting that he was willing to enter into any debate on secularism, he dubbed the Congress and the Communists as “pseudo-secularists” and said for them secularism was a “facade for pure vote-bank politics”. The BJP, he said, believed there should be no difference among Indians on religious or caste lines and this philosophy was embedded in the country’s tradition and culture. India, he said, would have become a theocratic state at the time of the Partition in 1947 had this tradition of secularism not existed. Maintaining that relinquishing the top party post by Mr Naidu had nothing to do with the outcome of the Maharashtra Assembly poll or the Lok Sabha results, Mr Advani said Mr Naidu had been seeking to give up party presidentship for quite some time now for personal reasons. Lauding the second-rung leadership in the BJP, which he termed as “talented and labourious”, he said even though initially he was reluctant to take up the baton from Naidu, the “blend of senior leaders and upcoming young leaders” encouraged him to accept the responsibility. He also described Mr Atal Bihari Vajpayee as one of the finest Prime Ministers in recent times. The Congress said instead of putting forth his vision and agenda for his party and putting his own house in order, the BJP leadership had yet to accept that its ideology had been firmly rejected by the people. “Instead of functioning as a constructive Opposition, they are continuing to dream of destabilising the UPA government and coming back to power,” remarked Congress spokesperson Jayanti Natrajan while lashing out at Mr. Advani for contributing nothing substantive to the polity. Mr Advani betrayed himself when he again remarked that the UPA government would not last its full five years, Mrs Natrajan said, describing it as a case of wishful thinking and “mungerilal ke haseen sapne.” The UPA government, she said, will run its full course. Coming down heavily on Mr. Advani’s remarks about the UPA government’s failures on the security front, Mrs Natrajan siad the former Home Minister was the last person to point an accusing finger at their government. “It does not lie in Mr Advani’s mouth to make these charges. He was the Home Minister when the attacks on Parliament, the J&K assembly and the Akshardham temple took place. It was their minister who accompanied dreaded militants to Kandahar,” Mrs Natrajan pointed out. She also castigated Mr. Advani for his remark that the UPA government had undermined the Prime Minister’s post. Mrs Natrajan said Mr. Advani had forgotten that as Deputy Prime Minister, it was he who played “super PM” in the NDA government. BJP President L.K. Advani today said he has accepted the invitation to visit Pakistan and has asked the Pakistan High Commissioner to workout some dates for his visit after the conclusion of the Winter Session of Parliament. “The Pakistan High Commissioner here had met me to finalise dates for the visit and I told him that it is not possible before the winter session, so, some dates be worked out after the winter session,” Mr Advani told mediapersons here. He informed that a Chinese delegation, which had called on him this morning, had also invited him to visit their country. Inaugurating a workshop on ‘Recent intelligence failures in the US, UK and Russia: Lessons for India’, organised by Observer Research Foundation, Mr Mishra said tendency of a government to tailor intelligence inputs to suit pre-determined action could lead to disasters. As an example, he pointed to the creation of “wrong intelligence inputs” from Iraq to suit leaders in the US and the UK which was used as a justification for the attack. Mr Mishra emphasised the need for coordination among security agencies. He said lack of coordination among the agencies was a problem not only in India but also in countries like the US. He said the attack on the World Trade Centre in the US may not have happened if there was proper coordination between the FBI and CIA. He said even the report on an earlier attack on the World Centre in 1993 was not studied and assessed properly. Noted strategic expert K. Subrahmanyam, in his keynote address, called for effective functioning of the Joint Intelligent Committee (JIC) and the National Security Council. He stressed on the need to have proper assessment of the intelligence inputs by experts. Releasing the report here today, Transparency International India Chairman Admiral Tahiliani (retd) said India had been given a score of 2.8 on a scale of zero to 10, with zero indicating the most corrupt country. Whereas Pakistan has done much better in cleaning itself up of corruption, improving its score from 2.1 in 2002 to 2.6 this year, India’s score has increased by only point one, from 2.7 to 2.8 during the period. China’s score improved from 3.4 in 2002 to 3.5 this year. The report was based on 18 polls and surveys among business people, residents and country specific experts and analysts. In India, the index is a perceived corruption, based on 15 surveys. Admiral Tahiliani said the amount of bribery in government procurement and related contract and other activities cost the Indian taxpayer a whopping $ 7,000 million. He said the Index rated Finland, New Zealand and Denmark as the least corrupt of the 146 countries surveyed, with score of 9.7, 9.6 and 9.5, respectively. Iceland also has a score of 9.5. India is ranked 91, while Pakistan’s rank is 132. 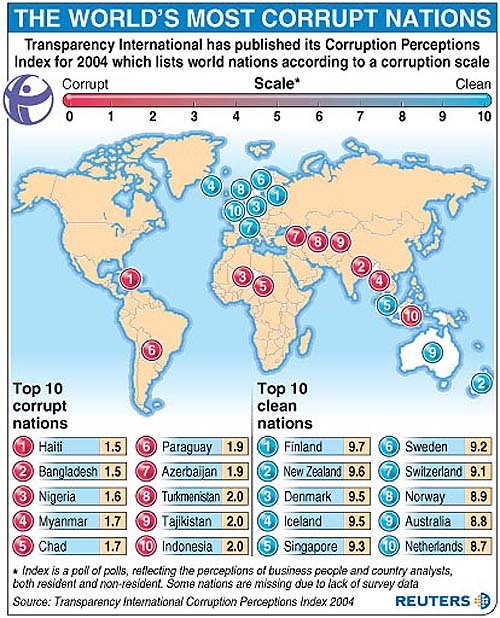 Bangladesh and Haiti are the most corrupt in 145th and 146th position, respectively. The Chief Minister, who is in the Capital to discuss state’s development needs with the Centre, told mediapersons that a proper atmosphere should be created to address the “internal dimension” of the Kashmir problem. “The dialogue offer cannot be spurned. All options have been exhausted,” he said. Mr Sayeed’s remarks have come at a time when the UPA government has taken fresh initiative to restart the stalled dialogue process with the separatist groups in the state. Home Minister Shivraj Patil had earlier conveyed the Centre’s desire to talk to all those willing to give up violence. The Chief Minister said steps taken by the state government to curb human rights violations and the “Indo-Pak reconciliation process” had made a positive impact on the situation in the Valley. Asked about ways to create proper atmosphere for a dialogue, the Chief Minister said it would emerge in due course and there was no need to rush. To specific queries about the Centre restarting talks with the Hurriyat, the Chief Minister said the process may take some time but there was no alternative to talks. The Chief Minister did not respond to queries about split in the Hurriyat Conference. He, however, said the APHC was an amalgam of parties who may have differing views. Referring to the turnout in the recent byelections in the Valley, the Chief Minister said it reflected the people’s faith in democratic institutions and their concern for socio-economic development. Mr Sayeed said Batamaloo, which was a hub of militancy, had witnessed a three-fold increase in voting percentage compared to the last election. Describing the turnout in Batamaloo as a “great breakthrough and a great opening,” he said it showed a change in the mindset of people. Mr Sayeed said the byelections remained largely incident-free and people were responding to the new situation. Calling for greater interaction among people living across the LoC, the Chief Minister said people should see the development and the change taking place in Kashmir. He favoured opening up the Muzaffarabad-Srinagar road. “Divided families should not be hostage to technicalities,” he said. The Chief Minister downplayed queries about package for the state during Prime Minister Manmohan Singh’s proposed visit to Jammu and Kashmir. “PM is a great economist,” he quipped. Calling for measures to create opportunities for educated unemployed in the state, the Chief Minister said the tourism infrastructure will be improved as the present facilities at places like Pahalgam and Gulmarg were inadequate to handle tourist rush. During his stay in the Capital, the Chief Minister met Prime Minister Manmohan Singh, Home Minister Shivraj Patil and Finance Minister P. Chidambram to apprise them of the security situation and the state’s development needs. The group is expected to meet on a regular basis to deliberate on international issues and advise the minister on international developments and the foreign policy options available to India. The experts on the group are Mr Muchkund Dubey, Mr Gharekhan, Mr Brahma Chellaney, Mr G. Parthasarathy, Mr Hamid Ansari and Mr Vinod Grover.